My blog discusses a variety of ideas and methods of creating colorful art. I like to share new methods of painting or making interesting artistic pieces which I am always searching for. I enjoy using different mediums and painting various subjects as you can probably tell when looking at my website. Although I do not write a blog on a daily basis, I write my blog when I feel there is something interesting or new that other artists would like to know. 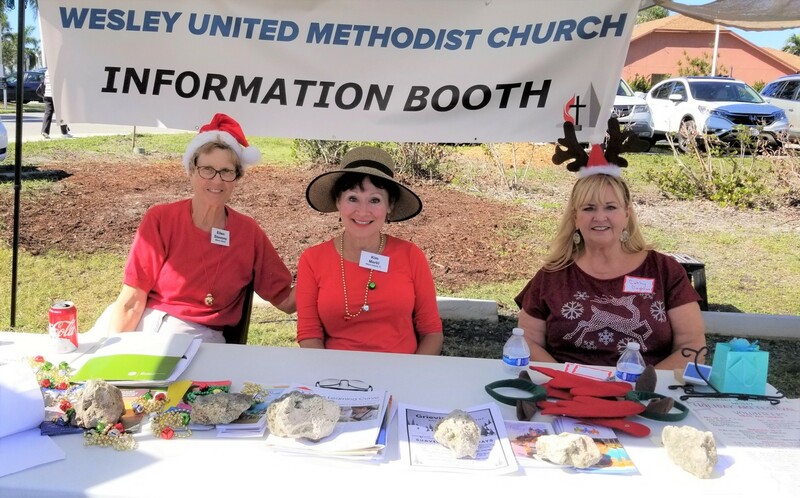 Each year our local church sponsors an art festival on the first Saturday of December. This is an outreach program to our local community, Marco Island, FL. Local artists pay no fee to participate, and the church provides a lunch to all visitors consisting of hotdogs, buns, apples, chips and cookies. This year we are having 20 artists participating including painters, photographers, shell artists, quilters, stained glass and more. There will be live Christmas music, and door prizes with donated art by the artists. We will have a Prayer Table for people to request prayer, and a table for children to create art. 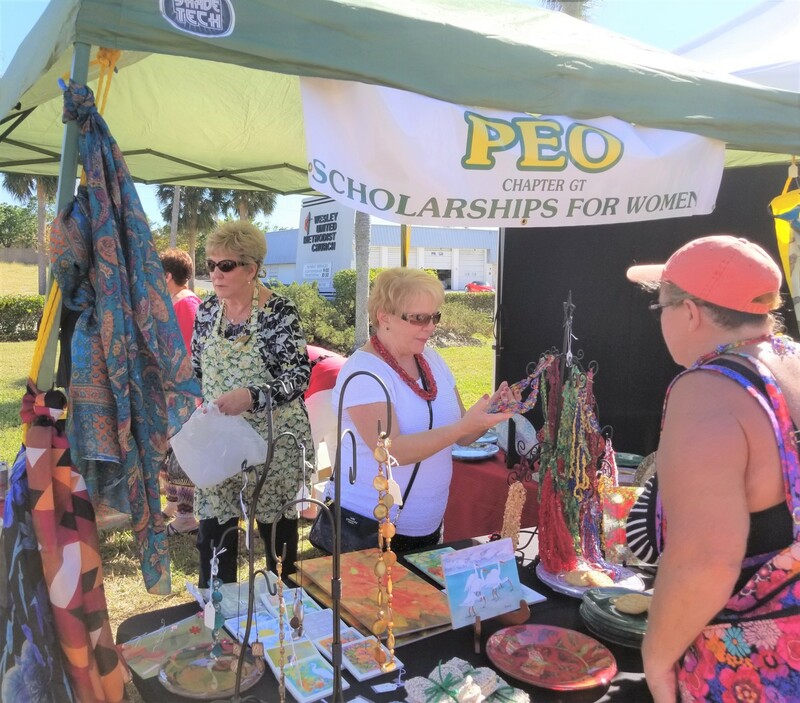 Many visitors and artists want to donate money, so we have arranged for all donations to go to our local Marco Island Center for the Arts for their Youth Art Programs. This type of event provides a great opportunity for the church members to volunteer and work together to make the event successful. We have fifty church members on the Volunteer List to work for 2 to 4 hours during the festival to serve the lunch, welcome visitors, help artists with setup and tear down, direct parking, and more. If you are in the area on Saturday, December 1st, 2018 stop by! I have found that having a private art show in my home to be a very successful and enjoyable experience. Rather than just inviting previous customers, art enthusiasts and friends to the event, one should consider having other types of artists to also show their unique work at the home art show. This makes it more fun for the guests and doesn't put pressure on the guests to buy from you. I never want to put guests in a situation that they feel pressured to buy my artwork. Refreshments during the event always is included. 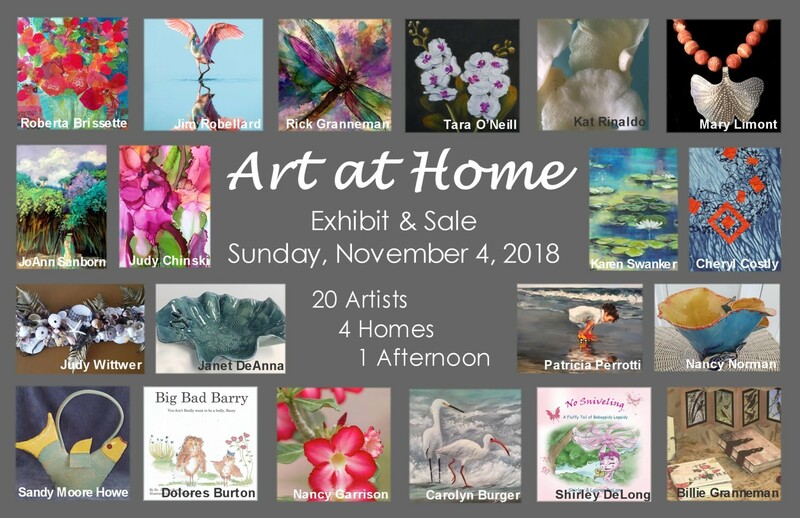 Last year four artists from our community decided to have a home art show in our homes at the same time; that is, on a Sunday from 11 - 4:30. It was a private event, with invitations given to friends, previous customers and people who we knew loved art. Guests were also encouraged to bring their friends with them. Each home had three different types of artists with their work displayed around the home. For example, I had an artist displaying her pottery, another artist displayed her oriental styled collages and encaustices, and I displayed my more traditional paintings of the local scenes. It was a great success, and visitors told us how much they loved it! This year we are planning to do the same event with more artists joining us in the same four homes. I shall have a photographer, a potter, a fiber artist and myself showing art in my home during the event. Art will be displayed on the walls, on easels both in and outside on the back lanai, on tables and shelves, and my small studio will also be open to the guests. Here is the front of the invitation showing the twenty local artists' type of work that will be part of this event. As you can see, we have many types of artists joining in this Art at Home show. When artists work together, they are more successful! The white ibis with his curved orange/red beak and long lengs is really fun to paint. The red/orange color against the bird's white feathers is a dramatic contrast. 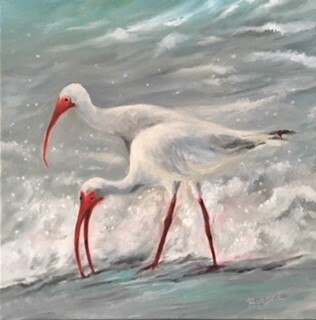 They are usually found in groups so I try to create paintings with two or more ibis. You can paint them in the surf, at the beach, in a park with green vegetation, or flying. Just be careful to choose a palette that will create a painting with colors that go well with the birds' red/orange legs and beaks. This is my most recent ibis painting with a limited palette of lemon yellow, quinacridone crimson, burnt sienna, cerulean blue, and payne's gray. "Ibis in the Waves" Oil 12" x 12"
Realistic abstracts are contemporary abstract paintings that remind the viewer of a realistic setting or object. Many people, when looking at an abstract painting, identify specific parts of the painting that look like a real object, scene or person. I tend to paint these types of paintings, especially when painting scenes of Florida. Such is the newest abstract that I recently finished. Called "Sky & Water", one can easily identify the general scene of Florida's billowy clouds, the water meeting the sky and the sea grasses often found in the shallow water near the shore. Painted on a square canvas, this acrylic painting becomes more fun to look at day by day. The reflection of the sky on the water with its pink, and various hues of blue, tie it all together..
You can learn more about this 24"x24" acrylic painting at my website: www.carolynburger.com. visiting from the north, trying to escape the cold weather up there at this time. My schedule for the remainder of August is listed below in case you are coming to visit the Marco Island area this month.